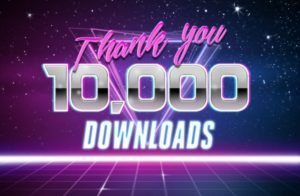 10,000 downloads! | All Eighties Movies. All The Time! For a topic of only 80s movies, you’ve certainly all shown us that these are still amazing films to watch and enjoy, even after all these years. To everyone that has taken the time to write, post, comment and simply just download an episode, thanks for your support, and boy, do we have a lot of movies still do do. Can’t wait! One Response to 10,000 downloads! Could not say it better myself – not even swearing! Can’t appreciate enough people choosing our podcast to listen to and download. We are both SO passionate about these movies as we saw them IN the 80’s and are now revisiting them again so that fans can remember, younger people be aware and just in general us reliving these awesome 80’s movies – whether critics loved them or not – or they were box office hits or total flops! Rather make a cult classic than have a movie kill at the box office for a week then forgotten for all time! Highlander and Xanadu both PANNED by critics at the time, failed at the box office – but so loved forever now. So again than you everyone for giving us a listen and please spread the word about our podcast! And thanks @lanamusic for such a great opening song and of course my partner @Colonelkickhead for our gifs and video – and finally the pure JOY of podcasting with you Angry! It’s a pure delight, we love these movies – and we just have the same passion about them!